Michael Miu (苗僑偉) and Jamie Chik’s (戚美珍) twenty-year-old son Murphy (苗俊) is allegedly dating outside of his race. 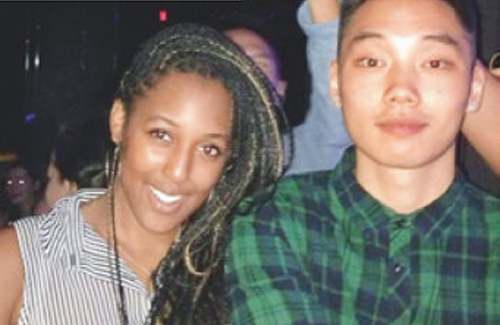 A Hong Kong tabloid recently exposed that Murphy and a dark-skinned female companion had posted couple-like photos on their social profiles, prompting rumors that the two are in an intimate relationship. Known for their open parenting approach, Michael and Jamie have given their two children free rein during most of their childhood. Both Murphy and his elder sister Phoebe (苗彤) are educated in Canada, and both have picked up the wild, partying lifestyle common to the youths of the West. Earlier, Phoebe was under public scrutiny when her online profile revealed drunken parties, boyfriends, and promiscuous clothing. Some are skeptical about Michael and Jamie’s methods, believing that the couple had unknowingly put their children at risk of dangerous habits. Although Murphy seems relatively better behaved, there is no lack of clubbing photos surrounding his online presence. Like his sister, Murphy appears to be popular among his peers and leads a fulfilling social life. Sharp-eyed reporters noticed that his rumored girlfriend appeared by his side frequently at friend gatherings, suggesting that at the very least, the two are active within the same social circles. This. First thing flashed across my mind when I read the article is that damn tabloid is so nosy and racist. I agree- even before reading this article, reading the title makes me frown..
Would the tabloid have made a big issue out of it if the girl had been white? I somehow doubt that. I could be wrong,but I don’t think it would be nearly as negative as this one is. If they do talk about her, it would probably be to praise her. Look at what happened with Edward Snowden. It didn’t matter if he committed a crime, all some of the natives seen was hot supposed American tragic hero. Login or Register before you can reply to Good Lord! So what?! What’s the problem that. In fact the heading is very racist! Hahah……….I thought that the saying of “once you’ve tried black, you can’t go back” only applies to women going after black guys and their BBCs……..this is quite new and refreshing when it’s the other way around. ”Can’t believe rumored these days. Interracial Relationship isn’t some crime and it could even be considered a ‘Cultural Exchange’. Plastic surgery can’t fool people forever. The truth always comes out with the offspring. I like Michael Miu though. As far as I know, I do not think Miu or Jamie ever had any major plastic surgery. I have watched them ever since the beginning of their career. I still remember Miu playing a cameo as the young foreign prince in Fei Yiing and he looks exactly the same, except he was a lot younger of course. You can have 2 decent or good looking parents but not have such good looking kids. On the same token, you can also have not so great looking parents but good looking kids. The way that genes mix are very mysterious. I do agree with Sky though that with those that find have PS and lie about until their teeth fall out. However, their bubble gets burst when they have kids as we have seen with that one Chinese couple. I guess that is a good lesson for those that constantly lie about having PS. Michael Miu was very handsome and still is now. The thing is the son looks like his mom. Dont get me wrong. Jamie was very pretty but if the daughter looked like her and she would be very pretty as well ( again the daughter is very cute in MHO). Just that the son is a guy obviously and his feature does not look as manly and as handsome as his dad cause he looks like his mom. If the son looked like Michael then he would look very very handsome. Raymond Lam is the one who have at least a few PS on his nose. Not Michael. Michael and Jamie are a golden couple IMO. Good looking and pretty much in love. Why are the media so invested in digging up news on the children of stars these days?? And so what if he’s dating someone outside of his race? So fecking what really? It just means this teen Murphy is way more open-minded, accepting and tolerant than the media and their narrow minds. One of my best friends is black. We’re often seen in pictures together. I guess we’re in an interracial lesbian relationship. those reporters..seriously have nothing else better to write. This news article comes less than 48 hrs before his sister, Phoebe’s UBC graduation. I’m sure she has her hard partying ways but she still did manage to graduate from university. Congrats to her and her family !!! I don’t see anything wrong with that. It’s 2013, interracial relationship is so common. Who haven’t dated someone outside their race. 50 years from now, ppl skin color in America will be beige. Hahaha we be mixing…. I do not like how the phrase “both have picked up the wild, partying lifestyle common to the youths of the West” was written. It has this negative conotation to it.. the sentence itsel is very broad generalization, a stereotype if I can classify it that way. Just because a youth live in the “west”, it doesn’t mean ALL youths who are living in the West have a “wild, partying lifestyle”. I found it a bit offensive because it gives this tone where all the youth who lives in the West are party addicts, but not everyone is a party addict, get drunk every night or go to the parties every single day… Yes, a majority of youth probably have at least one night of “partying” but some partying are under control (eg. no alcohol permitted). And furthermore, depending on where you live in the “west”, the level of the wild, partying lifestyle differs. For example, McGill = an university that has a higher rate of party than SFU (an university that is known for “people who don’t really party or go home after their classes”, whereas UBC has a better social life (eg. parties and whatnot). And then when you compare Canadian universities to American universities, that’s another level of partying. I think a better word choice would be “wild, partying lifestyle common to a majority of the youth in the West”. I have always like what you say. Very well put. I am Chinese living in the west and not all the teens are into wild partying. It is very racial and stereotypical comments from the Hong Kong press. Shame on them. Agree. In it seems racism is allowed in HK, while the west is trying to curb racism. It’s all about how you manage your time. I mean, everyone needs a social life in college. I sure did after seeing those papers, research, exams etc etc.. people need to breathe. So yes, I was a clubber myself but I knew where my priorities were and def set boundaries. It’s all about time management and knowing when to stop. I agree that netizens specifically Chinese netizens, have this gutted hatred for ‘parties’ and if committed you’re from the wild or something. @Bubblez: Totally agree with you! Unfortunately though, this is the HK media we are talking about, so I’m not the least bit surprised at this type of news….after all, the HK Media reporters seem to be perpetually living in the Stone Ages or something. I mean, how else can we explain the ridiculous stories that they come up with and why they seem to make a big deal out of the smallest of things? With all that said, I have to say that I really love Michael’s response to reporters…though if I were him, I would probably call the reporters out right then and there for being racist, but of course, that’s just me…. I find your comments ironic. During my college days when I visited HK, my cousins’ and their friends social lives were certainly more “wild partying” than mine and my friends in the west. I guess there are no clubs in HK where college age Chinese “party”? she’s quite pretty. glad the new generation aren’t as racist as the hk press. i can’t stand how close minded some people are! ughh ..
That’s why I fail go see what she saw in him. He is even worse looking than his dad. Yeah, I was just about to comment that if I were shallow, I’d say that the girl is pretty and he is not exactly handsome. Very flat typical chinese features, in the west they are called “chinky” (a derogatory term). She could easily find a better looking bf, with her sharp looks. So it’s not like Michael Mui’s son is lowering himself by dating outside his race, or more specifically a black person. There is more to a person than what meets the eye. My cousin married a half lady and she is a great wife and mother. It’s the inside that counts. Meant do say half black lady. I agree and it is sad that many of those traditional folks are still so close minded. I remember Andy Lau once mentioning that he met a fan that was black and he was happy to see non Chinese liking his works. It was because his girlfriend was Chinese from HK. Good God why is this even news? So what if he’s dating her? This seriously sounds racist! it means his face look like a party type. …What the !? Why is this seen as something wrong??? .. I support. So what if he is dating that black girl. By the way, she looks pretty. Pretty sparkling eyes. I honestly don’t understand what the big deal is? Yes he’s dating a black girl and yes his parents are famous celebrities. Who cares! Thank goodness he didn’t just pick up some asian chick from Vancouver because hello that’s Asian Central. Good for him for being open to diversity if its true! Secondly, I’m surprised that he doesn’t have any of his parents genes.. He’s not a looker. I think he kinda looks like his mom and the daughter looks like Michael. Wow! she is hot! Good choice Murphy. I approve. Yes, what the feck is right. I too like when Michael asked the losers “what Era r we living in?” It is about time these outdated dinosaurs catch up to the modern times. My cousin who is ver close to me married a beautiful black lady from Trinidad in the Caribbean. She saved him from so many things. He got burned by two Hong Kong women so badly that he had a nervous breakdown. His wonderful queen saved him in many ways. He is married, happily, and they have two wonderful children, making me a happy god father. They even call me uncle. We all love her so much. It is about who you can love, trust, who respects you, who listens to you, who will sacrifice for you. I am glad to see so many wonderful non racial comments, it makes me feel good. Teen goes clubbing. Big deal. I like Micheal Miu’s reply to the reporters. Way too go, man. I respect him. Wow ! she is hot and beautiful way more better looking than Murphy. Murphy got a good catch, No wonder Michael got no objection. Outside his race? ZOMG! NO! lol… He’s right… what era are we living in? The media in HK might want to take a walk in downtown Toronto one day. Agree. The HK media should visit cities like Los Angeles, New York, Vancouver, Toronto where interracial relationships are common. I’m upset with the reporter’s connotation that the west is wild partying and bad influence and produces situation where celebrity’s chinese child will date black person. What does clubbing mean? It has many meanings to many different people. It can be socializing and networking, dancing as a form of exercise, unwinding and relaxing while indulging in alcohol or a combination of the three. Many media tend to embellish the negativity of clubbing as getting wasted into a drunken stupor which may not be the case. Many patrons drink responsibly. I think the female looks more appealing than the male in the photo. Wow wtf tabloids are so nosy they follow you to Canada too? Please just leave his son alone…it makes HK look really bad. I agree and there are attractive people from every race and nationality. It is great that Miu is so open minded. This reporter sounds so racist. I once knew a girl who dusted a black guy and her parents were against it, so she said that if you take off all of skin, we are all the same, so what is the difference? That convinced her dad but not her mom. Her mom said that if she had kids with that black guy that people will discriminate against them. Asians and other minority groups get discriminated against too. I am glad that many parents are more open minded now which is great. What is wrong with you lately.?. All these funny little mistakes in your comments, lol. “once dusted a black guy”, That is so funny. I was wondering what you meant until you said once “dated”. I still had a good chuckle. True True, what you said. Peel away the outside layer of skin and we are all he same. I too have a cousin who married a black woman from the Caribbean island of Trinidad and she is lovely inside and out. Good to see that there are us Chinese who are not like those racist media idiots. Party or not party as long as he is a good person and good son to his parents and good brother to his sister and its his business. Those annoying reporters. If they were to get married, their kids would not be black or white but they would be mix of asian and black. And they would look beautiful. Big deal so what if he dating an black women… I am Chinese and I marry an Pakistani man… We got an son together.. The comments made about their union are disgusting and irresponsible. With all of the things they’re talking about,all these people can talk about? My words for these racists: Nobody can make your kids do something they dont want to do. If they do good,it came from them, if they want to do bad, that’s on them. You can raise your kids the elements of your culture all you want,but their personality will tell them to do otherwise and with more rights of expression that exists in the western world, just let them be even more expressive. It’s was probably in them all the while but some people just thing ones culture is suppose to protect them from partying. I call the comments “irresponsible” because they put the blame on the parents and them. No..what ever they do ,the do. Being Chinese isn’t going to guarantee goodness from your kids. In that case, none of the crimes/naughtiness I read in Chinese papers wouldn’t exist. God! it just really show you what makes news there. The world could end and the ” bad” news they’ll talk about is ” Chinese Boy Dates Black Girls” Oh please!